Postage stamps commemorate the people and events that shape the United States. In this collection of the most valuable American stamps, we highlight not only the history portrayed but some of the other features that make them valuable. As you see, many of these predate the 20th century and are very rare items. These contribute significantly to the hive values they carry for collectors and dealers. Mistakes sometimes yield great value, as demonstrated by this entrant on our list of most valuable American stamps. The “Inverted Jenny” is a Curtiss JN-4 biplane which erroneously is printed with its wheels up. Presently, only 100 of these stamps exist. 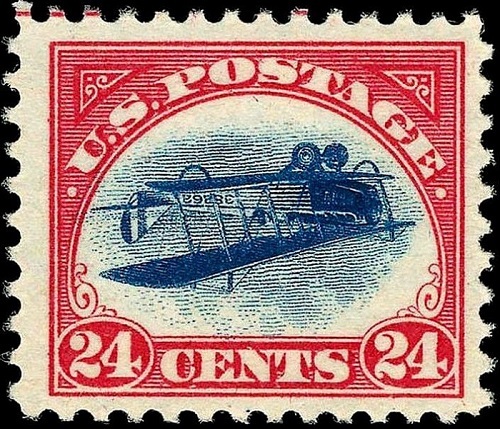 This 24-cent postage depiction of the biplane honors the “Postman of the Skies.” On May 15th, 1918, the Postal Service first delivered mail by air from Washington DC to New York City. Cross-country deliveries from New York to San Francisco became commonplace by the 1920s. According to Wikipedia, an Inverted Jenny stamp was sold in 2007’s Robert A. Siegel auction for $977,500. Several stamps on our list of the most valuable US stamps were crafted in the Civil War era and the years shortly thereafter. One such is this two-cent Andrew Jackson stamp. It gets the moniker “Black Jack” from its background and use and filling or outlining some of the letters in black. 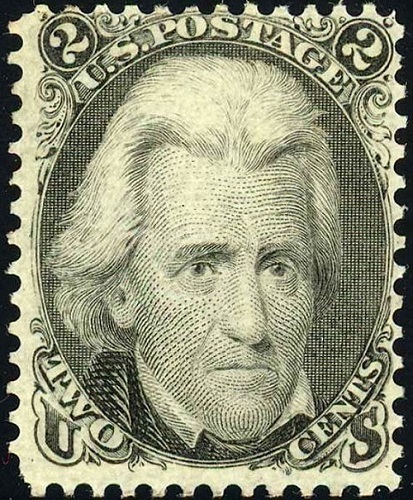 The stamp commemorates the seventh president of the United States, Andrew Jackson, whose term spanned from 1829 to 1837. Embossed letters, known as grills, serve as devices against the illegal use or forgery of the stamps. On the Blackjack, the grills come with letters C, D, E, and F, with the D Grill being very scarce. According to ScottOnline.com, a block of four Black Jack stamps was listed in the 2018 Scott 84 catalog at $80,000, bringing this difficult-to-value stamp at $20,000 per piece. Stamps appear on list of most valuable American stamps because they are very rare. This Benjamin Franklin stamp with the “z” grill and its horizontal ridges fits that bill because there are only two known in existence. Benjamin Franklin is one of a number of non-presidential figures who are immortalized on stamps. However, he is regarded as one of the nation’s founders. The Franklin stamp finds itself within a series of stamps including presidents Abraham Lincoln and George Washington. Coincidentally, these stamps were created just two years after the end of the Civil War. 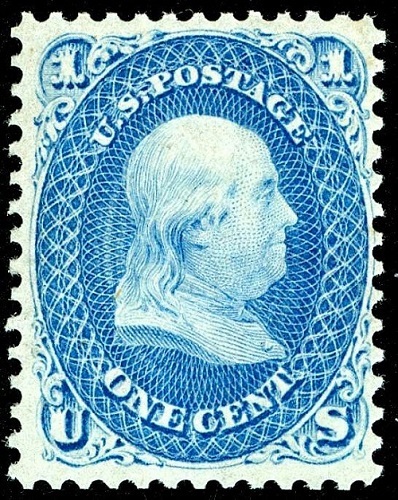 The 1867 Ben Franklin stamp is valued at up to $935,000. The Mississippi River and St. Louis afford great inspiration for this $2 stamp. 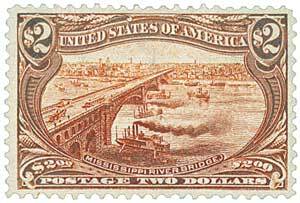 The Trans-Mississippi Stamp celebrates the creation of a 6,442 ft-long arch bridge over the Mississippi River to connect the eastern and western halves of the United States. The admission ticket for the 1896 Republican National Convention held in the city provides the centerpiece for the stamp. Some of the most valuable US stamps, such as this one and the Inverted Jenny, did not assume their originally intended appearance. The plans of the US Bureau of Engraving and Printing called for this stamp to have two colors. However, the United States was embroiled in the 1890s in the Spanish-American War. As such, the Bureau employed stamps to raise money for this effort and needed colors for many other stamps. Therefore, only one color presents itself on this stamp. Issues of this stamp are priced between $725 and $2,500 depending on their condition. 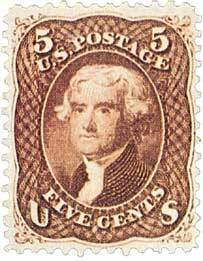 This stamp of the third president of the United States saw its first known use on the second day of 1862. The Civil War had recently started and, along with this stamp, many other stamps and paper currency were printed by the finance the Union’s effort to suppress the rebellion. An estimated one million of these stamps were issued, produced on a flat plate and without any watermark. 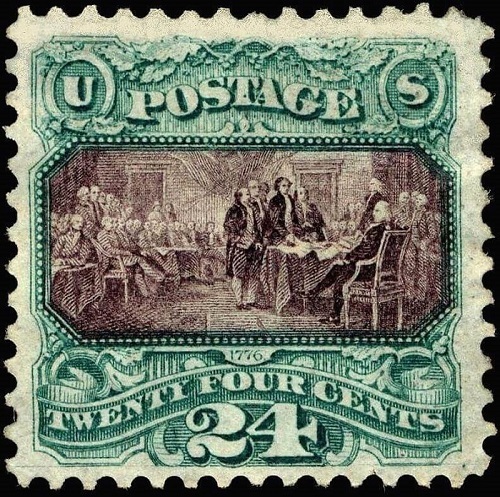 This stamp is priced between $275 for used issues with small flaws and $2,750 for mint issues. 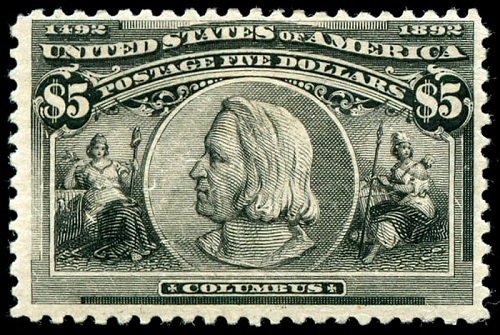 At its issuance, the $5 Christopher Columbus stamps did not generate much demand. In fact, customers purchased only 21,844 of the 27,350 produced. The unsold stamps were destroyed. However, the stamp, even in 1893, would have been one of the most valuable American stamps. The five dollar face value at issuance translates to several hundred dollars in today’s terms. Collectors displayed great interest in the stamp and European collectors eagerly sought the Columbian stamps from American tourists there. This Christopher Columbus stamp was issued as part of the 1893 World Columbian Exposition’s 400th-anniversary celebration of the explorer’s arrival in the New World. This 1893 Columbus stamp is priced between $1,350 for used issues with superficial flaws and $4,000 for those in perfect condition. The 16th president of the United States served during the most divisive. In the country’s history. The likelihood of Civil War loomed over the country when he took office in 1861. That war had begun two months into a term with the firing of shots at Charleston South Carolina’s Fort Sumter by Confederate troops. 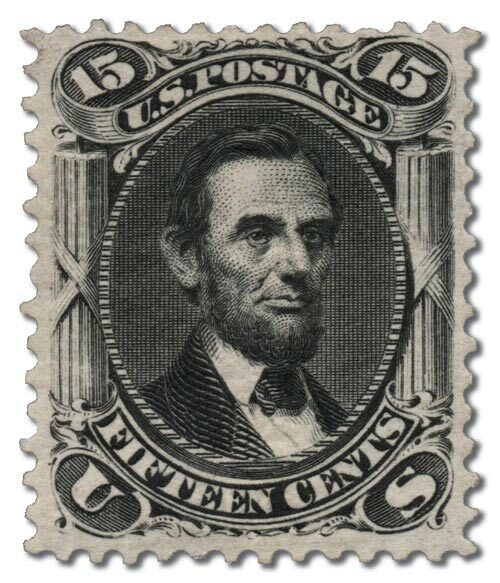 This 1875 Lincoln stamp has a black background and bears the postage rate of 15 cents. It’s priced between $3,250 for unused mint stamps and $35,000 for used ones. John Marshall was a United States Supreme Court Justice and Secretary of State in the early 19th century. His likeness dons the first stamp issued by the Bureau of Engraving and painting for postal use. It could have appeared on a list of the most valuable US postage stamps in 1893 because it already came at a high price and very few were printed. Collectors, however, did not experience gains. As a result of that and the limited Supply at rollout, this stamp ranks as one of the rarest on our list of most valuable u.s. stamps. The stamp does not have a watermark. 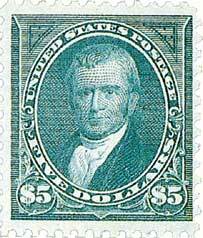 This John Marshall stamp’s price starts at $1,250 for used issues with small flaws and can reach $5,000 for unused ones. What list of most valuable American stamps does not include the country’s first president? 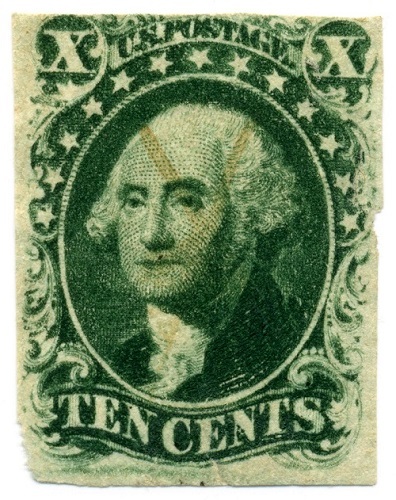 George Washington’s face appears on this ten-cent green, Type IV stamp. Not many of these are in existence, as the stamp is recut only once from the sheet at top and bottom. This helps explain the high value of it. According to Mystic Stamp Company, this 1857 George Washington stamp is priced between $650 and $10,500. The Declaration of Independence serves as America’s birth certificate. While most of us associate the Declaration with July 4th, 1776, the iconic John Trumbull painting of The Declaration of Independence actually shows a June 28th, 1776 meeting of the Second Continental Congress. At that gathering, the draft was presented. This is the central image of the twenty-four cent Declaration of Independence tribute stamp. At the center of this worthy nominee for most valuable US postage stamps, you will see John Hancock, John Adams, Rodger Sherman, Robert Livingston and Benjamin Franklin. One of those committee members, John Adams, would become the second president of the United States. This stamp is priced between $385 and $3,500 depending on its condition according to Mystic Stamp Company, but this USphilia.com page makes it available for $230 and this eBay listing had it for $170 at the moment of writing. If you want to find out more about how collection stamp pricing works, check out our stamp collectors price guide! 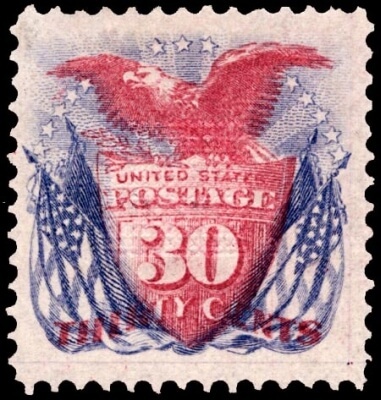 The 30-cent “Shield, Eagle and Flag” stamp represents another example of an inverted stamp. You notice it in particular when the flags are turned upside down. The invert resulted from the merging of the center design and the frame. With multi-colored printing of stamps, came to runs through the stamp printing press. Yet, the error makes this one of the most valuable US postage stamps. As another first impulse tool stamps, the shield and eagle symbol was the first that depicted someone or something other than a national leader. Its estimated value is between $330 and $4,500 depending on its condition. Throughout this stroll through the most valuable American stamps, you have seen features and the history which makes these sought-after collector’s items. These stamps represent a mix of US presidents and others instrumental in the founding of the Republic, as well as threshold events. Feel free to share any ideas you have for the most valuable US stamps.